McAlpine PC is a highly specialized commercial law firm focusing on construction and environmental litigation, real estate and development matters and business law. The Firm focuses its practice in the areas of litigation and transactional law on a local, national and international basis. Clients are almost exclusively business entities ranging from Fortune 500 to smaller local and regional companies. 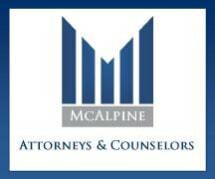 While the vast majority of our clients are well-established companies for whom we provide a range of services, McAlpine PC also provides services to select smaller entrepreneurial enterprises that show promise in their industry sector and in becoming long-term clients within the Firm's specialty areas. Our boutique law firm is comprised of attorneys who previously served with large regional and national law firms, each ranging in size from 100 to 1000 lawyers. We also have Of Counsel relationships with various lawyers in specialty areas and established relationships with various firms throughout the country in connection with out-of-state litigation and transactions. Continuing legal education is encouraged among the Firm's attorneys as is continued specialty training and participation in various local and national bar association specialty committees. McAlpine PC emphasizes the use of technology in the management of cases and in achieving optimum efficiency in our litigation practice. In this respect, the Firm has extensive experience in large-scale litigation where amounts in dispute range from several million to several billion dollars. We regularly utilize the latest developments in document imaging and retrieval systems, computer-based testimony systems, real-time testimony generators and remote access systems. The Firm draws heavily on it’s commercial and contract litigation experience in its transactional work. Hands-on experience with how contracts are treated in the litigation process has proven invaluable in drafting and negotiating contracts on behalf of clients. McAlpine PC and its attorneys are committed to providing the highest-quality legal representation in the most efficient manner possible. We achieve this by striving to understand the business of our clients, being responsive and timely in dealing with client matters, through exhaustive attention to detail and by consistently exceeding client expectations.